This bird was photographed in January, 2012 at Ballyhome, Bangor, Co. Down where it was searching for scraps of food washed up on the foreshore. 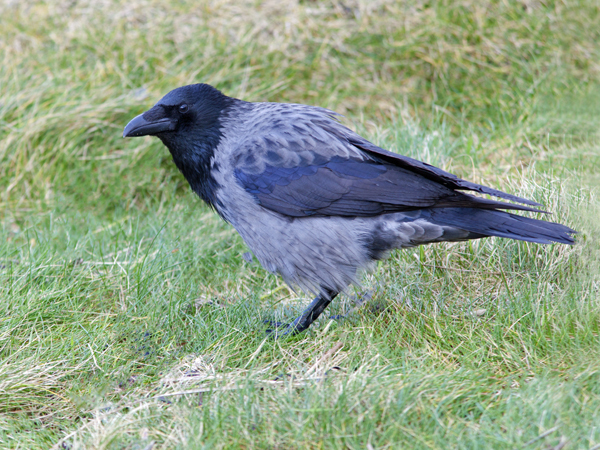 I have been observing hybrid crows in this area for many years and the small population there seems fairly stable. People seem to like to pull their cars into the larger parking bays along the Ballyhome end of Seacliffe Road, Bangor and throw out bread for the gulls. Crows being clever opportunists take advantage of this generous food supply and there are often “Hoodies” stooging in the area waiting for easy pickings. Watch for “Hoodies” that don't look quite right and you will come across hybrids in various guises ranging from spotted birds like this one through to almost completely black individuals with greyish patches and sometimes individuals with very pale patches in their plumage; some even have whitish wing bars. Walking towards Bangor from Crawfordsburn Country Park I start to see them in the area around Carnalea where there seems to be a concentration of hybrids in all of the forms I've described above. But nowhere are they as bold and offer themselves more readily as photographic subjects as they are at Ballyhome.